“Clean eating” is a term frequently used these days. However, it is one that I personally try to avoid as it can create a problematic view of food that can incite debilitating shame (i.e: clean versus dirty; good versus bad – polarized beliefs are something mental health professionals try to steer clear of 😉). While healthy eating is something to prioritize, many clinicians are seeing problems arise when one’s relationship with food starts to adversely impact various facets of a person’s well-being. the term ‘orthorexia’ was coined in 1998 and means an obsession with proper or ‘healthful’ eating. Although being aware of and concerned with the nutritional quality of the food you eat isn’t a problem in and of itself, people with orthorexia become so fixated on so-called ‘healthy eating’ that they actually damage their own well-being. 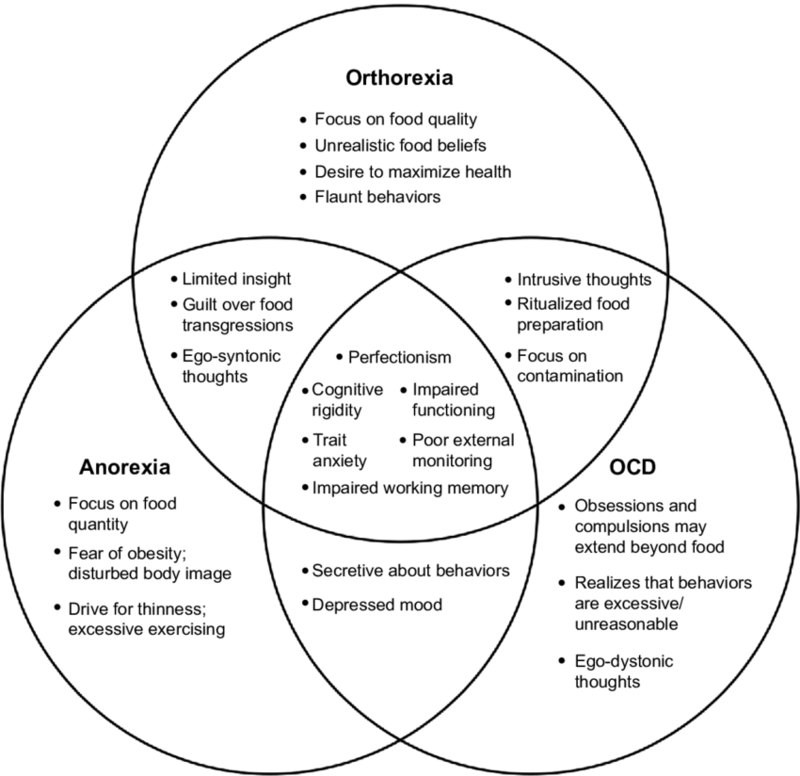 As noted in the graphic below, orthorexia has some overlapping symptoms with anorexia nervosa and obsession compulsive disorder (OCD). A person with orthorexia is obsessed with creating and maintaining the perfect diet (rather than an ideal weight like those suffering with other eating disorders), with a fixation on eating foods that are deemed “pure” or healthy. Orthorexia is characterized by food obsessions/fixations that hinder everyday activities, where rigidity around food “rules” lead to social isolation and increased debilitating anxiety presentations. Orthorexia goes beyond a lifestyle choice. Obsession with healthy food can give one a sense of superiority to others, which leads to fractured relationships and diminished social engagement (humans are social beings, and as such we need social connection – we tend to exhibit signs of depression when chronically isolated). An ongoing obsession with “clean” eating may cause a restriction of calories simply because the food available does not meet the orthorexic’s strict standards. This can cause one to lose weight akin to someone with anorexia, leading to malnutrition, hair loss, weak bones, organ failure, cardiac complications, and even death. Common foods that an orthorexic will avoid include, artificial colours, flavours or preservatives, food that have been genetically modified or have been sprayed with pesticides, fat, sugar or salt, and animal or dairy products. Because healthy eating is considered sensible and desirable, it can be harder to determine when it has slipped into problematic orthorexia. Akin to anorexia nervosa, sufferers of orthorexia often exhibit symptoms such as a desire to achieve control over one’s life through the control of food intake, seeking self-esteem, mastery, and spiritual fulfillment through controlling food intake, claiming food allergies/sensitivities as rationale for avoiding the consumption of many foods, elaborate rituals about food that result in social isolation, and co-occurring disorders and behaviours such as OCD, anxiety disorders, self-harm, or personality disorders, and substance abuse disorders. Treatment for all eating disorders needs to be considered from a biological, psychological, social, and spiritual context. Many maladaptive coping behaviours (disordered eating, substance abuse, self-harm) are rooted in trauma, therefore it is prudent to work with a clinician who is trauma-informed and can offer a trauma-specific form of treatment that is a fit for the individual. The obsessive tendencies associated with orthorexia can indicate a co-occurring disorder that should be diagnosed and treated by a psychiatrist. Orthorexia is becoming increasingly commonplace, particularly with young people. If you or someone you know is suffering, help is available.